Properties in Maine-et-Loire average 4.6 out of 5 stars. 4 **** cottage in the heart of Saumur. Private garage, large terrace. Property 3: 4 **** cottage in the heart of Saumur. Private garage, large terrace. Le Logis des Abbesses - A hanging garden on the Loire. Property 20: Le Logis des Abbesses - A hanging garden on the Loire. For a stay in 2 very quiet in the Val de Loire countryside! 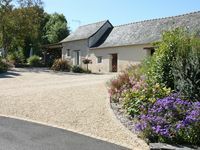 Property 21: For a stay in 2 very quiet in the Val de Loire countryside! Traditional 300 year old French Cottage with WiFi, private pool and garden. Property 38: Traditional 300 year old French Cottage with WiFi, private pool and garden. Loire Valley cottage near Saumur, peaceful but close to village amenities. Property 44: Loire Valley cottage near Saumur, peaceful but close to village amenities. Small independent house, ideal couple, solo, traveler of the Loire by bike. Property 48: Small independent house, ideal couple, solo, traveler of the Loire by bike. Right in front of the Loire River, it is walking distance to many shops and restaurants. There is ample parking conveniently close by. The apartment is quite spacious with a nice kitchen, the bedrooms, a large living room which can be used as a bedroom, and a good sized dining room. Sweet, immaculate grounds, cozy house. We enjoyed our stay in the lovely countryside.